Ohm beads Beadmas day 9! The winner is Ana Tomás G! Please p.m. your address so we can sent you your prize! Today I am hosting Beadmas and I am very excited! Beadmas is all about Ohmily from around the world connecting, having fun and winning a bead or two! 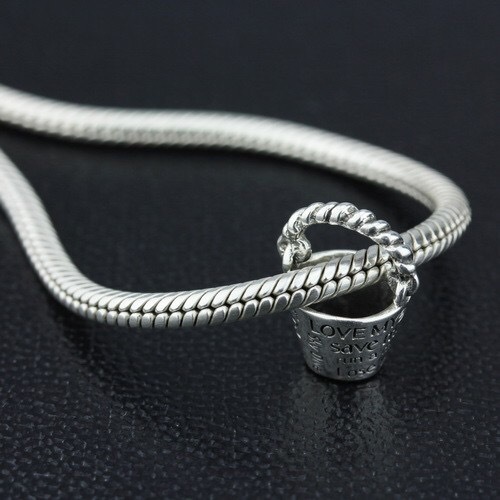 The price to be won today is the Bucket List (bead only, without the bracelet)! The winner will be picked at random. You can comment below and the contest closes at midnight tonight my time in the Netherlands, CET. As you know the home of Ohm beads is Seattle, known for coffee, rain and the Spaceneedle. I would love for us to get to know each other better. So your task for today is to descibe a fun or interesting fact from your hometown or state or country. What is iconic? Or something we really need to know, set the record strait! You can also comment on eachothers posts, to let us know if you learned something new! Good luck! I will start. I live in The Netherlands, also known by the name Holland. But did you know that Holland is only the western part of the Netherlands? It is now globally used to name our country and I use it too from time to time. So that is why we have two names for our little country! Hi! I from Russia, live in the beautiful city and the capital of Moscow. In Moscow there are 7 absolutely identical high-rise buildings: 2 hotels, 2 office buildings, 2 houses and university. In English this ensemble is called by Seven Sisters. Hi Helena, that is such a fun fact to know! Thank you! Hello! I live in Italy and my city is Bergamo, about 50 km from Milan. Bergamo has the old city on the hills and it is surrounded from the walls that in a far past was defending the city from enemies. The inside of the city has the old house, streets with ‘sampietrini’ and in the middle ‘Piazza Vecchia’ (old square) with a fountain, the Library, University, and also ‘Cappella Colleoni’ with its famous inlays masterpiece. Hi Giovanna, that sounds delightful! A place to visit one day! Thank you! Hi)) I live in Moscow) Moscow is the largest city in Russia, and on the area of Europe. The city’s area is 1,081.00 square kilometers. Hi Mapnr, a lot to explore when to visit, thank you! I would love to visit Moscow one day, it sounds fascinating. I live in Russia, our country is very high. it has two of the city known around the world Moscow and St Petersburg. But my small town and is located on the road between the two cities. Solnechnogorsk and its name (literally, Sun Mountain), he acquired during one of the visits of Empress Catherine the Great from one capital to another. Passing by the settlement, she drew attention to how sunny and said – “sunny mountain”. This name became the name of our city in the future. Hi Yulia, that sounds like a beautiful place you live, thank you! Greetings all! I’m not from here, but I’ve lived in New Orleans, Louisiana for the past year and a half. The city is also known as “The Big Easy,” “NOLA” (for the city and state abbreviations: N.O. and LA.) and “The Crescent City” for it’s distinctive shape following the curve of the Mississippi River. If you come to visit here, be prepared to EAT! New Orleans is all about some good food and good music. And Mardi Gras is just around the corner, falling on Feb. 28 this coming year! Hi Emmaemily, a wonderful place to relax! Thank you! Hi Ohmily! I live near Milan, in Italy. Milan is known as the capital of fashion, but it also a great place where you can eat divinely, and not just pizza or spaghetti!!!! The tipical dishes of Milan are: risotto alla milanese con ossobuco, i bolliti, mondeghili, trippa alla milanese, cassoeula, cotoletta e il panettone!!! Hi Francesca, I love Italian cuisine, even more than fashion! Thank you! Hi Ohmily! I live in France near Paris. Did you know that we have our own small Statue of Liberty in Paris since the big one was a gift from France to the US? Hi Alexandra, I did not know that, that is awesome! Thank you! I was born in Marietta Ohio in the USA. My hometown is very historic! It was the first permanent settlement in the Northwest Territory when the Colonies were established. We have a museum with the home (log) of Rufus Putnam who and the history of the Fort Harmar that was established at that time. Rufus Putnam also helped get the land that eventually became Ohio University where I teach today! Marietta and the town close which holds Ohio U are both beautiful towns with grand trees and lots of green lush hills! I am from a beautiful small historic town!!! Hi Michelle, a beautiful place with a long history! Thank you! I live in Saint-Georges, in the province of Quebec, in Canada. In the province of Quebec, we speak french…and the rest of the Canada speaks english 🙂 We have a lot of snow in winter but great sunny days in summer. And we are great productors of maple syrop! Hi Véronique, maple syrop is liquid gold, yummy! Thank you! Most of modern-day Roxborough was once part of Roxborough Township, which was incorporated into the City of Philadelphia following the passage of the Act of Consolidation, 1854. At this time Roxborough was the home of the area’s wealthiest; the owners of the Manayunk mills. These textile mills produced revenue that was spent building schools, parks, and a large Victorian manor built for the area’s elderly women, The Roxborough Home for Women. Since the 1950s, most of Philadelphia’s major television and FM radio stations have located their transmission towers in Roxborough because of its hilly terrain and high elevation. Public television station “MiND”, once called “WYBE”, was also formerly located in Upper Roxborough, close to neighboring Andorra. I Live in France, in Champagne actually. Even If it’s a little bit « cliché » I can’t speak about my countrys without presenting a part of the great variety of food and cuisine to be found in France : some things like the “baguette” the famous French bread stick, change little from one region to another; but buying a fresh baguette, coming warm from a traditional bakery, is just delicious! Then there’s wine. From heavy Mediterranean reds to light fruity sparkling whites, via less well known varieties including “grey wine” (vin gris) and “yellow wine” (vin jaune). And of course Bordeaux, Burgundy and Champagne are just the most interesting; especially with our smelly cheeses. We can wonder why French would be the most grumpy people in the world. Any pretext is good for complaining: traffic jams, salary …. This is a real contagious national sport ! But, when we meet foreigners, we become suddenly talkative and charming. I love the name , sounds a lovely place to live. Hi Kelly, what a versatile place with a unique history! Thank you! Hi Alexandrine, I really never been to France, but I adore the wine and cheese! Thank you! Hi Lan Anh, the confusion! When I am abroad most people think I am German! Thank you! That is really interesting that you have a Covent Garden and Thames river, maybe one day I will get to visit the Ontario version. Hi Trish, small is beautiful too! The area sounds wonderful, thank you! I didn’t know London, Ontario had a Covent Garden Market. How fun! I come from the UK in S.wales and live in a small market town called Abergavenny. The capital of Wales is Cardiff where we have the Millennium stadium.The Welsh Dragon (Welsh: Y Ddraig Goch, meaning the red dragon, pronounced [ə ˈðraiɡ ˈɡoːχ]) appears on the national flag of Wales. The Welsh language is mainly spoken in North Wales but it is taught in schools more now. My favourite Welsh word is Cwtch meaning cuddle. Hi Clare, we want to visit on day, our son is a big dr. Who fan! Thank you! I was born near Paris. Although a lot of people live there (it’s France’s biggest city! ), very few people are “actual Parisians”, and by that I mean “people whose parents and grand-parents already lived in Paris”. Lots of people arrive to Paris for college or for their jobs, and move to the suburbs later in life. Hi Colors, are you a Parisian? And the ooh la la, that is very funny, I did not know that! Thank you! I live in Russia, Chelyabinsk.Chelyabinsk is a big industrial city in the Urals Mountains. If you are in the city, you don’t see mountains, they are so far from the city)) Now my native city is famous for meteorite, that came to the Earth. This meteorite is in the city museum, but the meteorite has fallen to the lake in 40 km from the city. That is very spectacular! I would love to see a real life meteorite! Thank you! Hi, I currently live in Groton, MA about 1 hour north and west from Boston. We are very rural. Our German exchange students thought it was very dark with very curvy roads and no sidewalks. Not like their idea of America at all. But we are not too far from the big cities. That sounds like such a lovely place to live! Thank you! I live in Melvin Village, NH on the shores of Lake Winnipesaukee, the largest lake in the NH Lakes Region. We have a year round population of 2,500 (5,000 in the summer). We are located just north of Wolfeboro, the oldest summer resort in the US and west of Ossipee, where the snowmobile was invented. From my dining room I can see the Castle in the Clouds and the Ossipee Mountain range. Naturally water and snow sports are the big attractions here. We do not have mail delivery to our house, but we do have 3 post offices where our post office boxes are located. No traffic lights, no street lights, no traffic. At night the stars form a blanket in the sky, something one cannot see from the more populated areas. We have deer, bear, bobcats, coyote, fox, porcupines – in short, I live in God’s country!! Hi Alicia, That sounds like absolute heaven! My kind of place! Thank you! I’m from the Annapolis Valley in Nova Scotia, Canada. It is known for all things apple! One of the best things is the annual Apple Blossom Festival with parades and fun activities. One of the things that people don’t know about Nova Scotia is that it’s not always cold. We have gorgeous, warm summers and some of the most beautiful white-sand beaches in the world! I miss it! Hi Mary, apple blossom is my favorite spring bloom! Your summers sounds awesome! Thank you! Hello, I’m from Knoxville, Tennessee USA, home to the University of Tennessee. The Great Smoky Mountains National Park is only 40 miles away. Knoxville is located in East Tennessee where there are beautiful lakes for boating, skiing, kayaking, swimming, and fishing. Hi Sara, I love to be active outdoors, absolute heaven! Thank you! Oooooh, I love learning about hearing about local history and facts from everyone! Ok, so I live in the Town of Islip, located on “Long Island” in New York, USA. Long Island is usually referred to as the suburbs of New York City, but by ourselves we have a population of over 3 million, more than many US states! This is why some people get confused when you say you are from “Long Island” and not New York (and yes, we can be grumpy from all the traffic 🙄). Geographically, parts of New York City are on Long Island, which is a 118mi/190km by 23mi/37km long stretch of land jutting out into the Atlantic Ocean. On the western end is Brooklyn and Queens and and all the way to the east is Montauk Point and the Hamptons. Islip, where I live is exactly in the middle, about 40mi/64km from the edge of Brooklyn. Islip was settled in 1683 by an English man from Islip, UK who purchased 50,000 acres from the Sachem Indian tribe. Their were many well documented partnerships and transactions between early European settlers and local native tribes at the time and many schools, streets and towns here still have Native American names. Later on in the Industrial Age, the Islip area became known as a playground for the American elite and super wealthy, with part time residents like The Vanderbilts, Bournes (Singer Sewing Machine) and Bayard-Cuttings (also related to William James psychologist) building their summer homes and hunting cabins here. George Washington is also known to have frequented some of our local homes. Today Islip is very built up with houses, buildings and businesses, but there are still hundreds of acres of lovely, wooded areas with lots of rivers, streams, lakes and parks right alongside ocean beaches and the famous Fire Island National park that we work very hard to preserve and cherish. Hi Beadhouse, a beautiful place loaded with history! I love that with almost every US city the beautiful countryside is never far away! Thank you! I am from Houston Texas USA. We are known here for the Houston Livestock Show and Rodeo! It is as big and fun as everyone says it is! We have tons of shopping and food (deep fried twinkies anyone?)! And the rodeo itself is a lot of fun too. We are also known for our steaks (yummy)! I would however like to clear up a misinterpretation though that all Texans wear hats and boots. We don’t all, but there are ALOT that do! Hi Jennifer, the shows and rodeos sounds like fun! Not everyone in the Netherlands wear clogs either! Hi Simona, I love it that you are here! Hi, I’m from Chicago. Did you know that Navy Pier is not built on land? It is a pier formed to support it and at one time it was having major problems from settling and fear of breaking away. They don’t list that in their facts. I got it first hand from someone who had to work there and get things back up and running. I still have a fear of going there because of that. Hi Krystle, that sounds scary! You are right, better safe than sorry! Thank you! I live nearby Copenhagen in Denmark. The tourist guides are always just telling about The Little Mermaid and Christiania as the main attractions. But what I love the most is the all the old buildings from the 1600th and 1700th century and the history of all the streets. Hi Charlotte, I love Copenhagen and Denmark! We visited Copenhagen and Tivoli a few times during Christmastime and we go on summer holidays in Thy for more then 10 years now! So your country still attract the Dutch! Thank you! North Carolina, land of magnificent mountains and stunning beaches, is my current home. Kitty Hawk, on North Carolina’s Outer Banks, is where the Wright Brothers made the first successful airplane flight in 1903. Hi Barbara, awesome part of history, I love that! Thank you! Hello, I live in Waterloo, Ontario, Canada. We’re somewhat known for having the largest Bavarian festival in North America (which is sort of interesting, given that our population is only around 400,000, so much smaller than many major cities in North America). I guess we like our beer 😀 We’re also known for our academics. The University of Waterloo was voted the most innovative university in Canada for 25 consecutive years, the top school in Canada for computer science and engineering, and the Top Comprehensive Research University in Canada for eight consecutive years. Hi Tracy, I love Bavarian festivals, living close to Germany! Wow, that is awesome, a science professor at our university of Groningen won the Nobelprice this year! Hi Tatyana, your city sounds like a very lively and wonderful place to live! Thank you! I live in the Netherlands. And did you know, that on November, 29th, we celebrate Saint Pancake (“Sint Pannekoek”)? It’s traditionally from Rotterdam, Kralingen. A dutch cartoon maker made it up in 1986. But later, it seemed that the celebration was older; it’s from 1899, and even before that, in the 12th century. On “Sint Pannekoek” we all put a pancake on our head, while the man of the house arrives, and we all say “happy and merry sint pannekoek”. Hi Karin, isn’t that the most fun holiday there ever was? Thank you! For tens of thousands of Armenians of Rostov is the one and only true homeland. Because a significant portion of the current capital of the South – the former Armenian town Nakhichevan, founded in 1779. Seeing his old quarters with stone houses, square layout and lines instead of streets, the guests of Rostov sometimes wonder – well, purely Peter. So after Anna, unlike his older brother, and built from the beginning on a regular plan. Before the lines, that their appearance city map obliged the legendary entrepreneurial spirit of the Armenians. Tell that to attain the status of a city, Nakhichevan appealed to the Empress Catherine. But she refused – too few streets were in Nakhichevan to increase of settlement in the city. On reflection, the Armenians quickly divided street across prospect number them the Northern part of the even numbers and the South is odd. As a result of the streets became twice more, the condition has been fulfilled, and Nakhchivan became a city. Hi TatbRHa, what a smart thing to do, very good! Thank you! Hello! I’m from Russia, from a small country town. In the center of the city flows the river, which forms the border between Europe and Asia. On the bridge over the river is a column that indicates the border. I live in the European part of the city. Hi Oxana, that must be strange to live in two different continents! Thank you! Oh yeah! Strange and interesting! Hi Nicoletta, I love carnival, the masked parades sounds like so mich fun! Thank you! Hi Alex, that’s awesome, awesome!! Thank you!! Yes, it is relatively safe, but for you New Yorkers a small country like ours must feel safe! One thing that is convenient is that all the cities are so close together! I live in Connecticut, USA the nutmeg state. Not sure why it’s called the nutmeg state since we don’t use a lot of nutmeg and no one ever talks about our abundance of nutmeg. In the southwest part of the state where I am we are very close to New York State and a 45 min train ride to New York City. In fact where I grew up a lot of people travel to the city everyday for their jobs. I’m on the coast so we do have water here but it’s only the Long Island sound so not direct ocean. We have all seasons here and I hate winters in Connecticut. Hi Lauren, very handy to have the big city and the water close to hand. Ours winters are wet, I don’t like only rain, I would like some snow from time to time! Thank you! Hi! I live in Collegeville, Pennsylvania, in the United States but I am from a small town outside of Cincinnati, Ohio. Cincinnati, like Rome, Italy has seven hills. It was named after Lucius Quinctius Cincinnatus who was an ancient Roman politician. Cincinnati has a wonderful zoo which is the second oldest in America (the oldest is in my adopted home town of Philadelphia, Pennsylvania). It is a lovely place to live and work with a world class symphony orchestra, major league sports teams, beautiful architecture, and wonderful food. I live in Fort Worth, Texas. No, we are not all “cowboys”. LOL We do have a very large state! And a lot of land, where you can see cowboys if you really want to. In downtown, we have a cattle drive every week, where they move the cattle from one locations to another. Just like it was done back in the old days. Southern Texas is also know for some wonderful wines! You can travel down our highway, I-35 and hit several vineyards along the way! Texas is a very large state, with SO much beauty to do and see! Hi Stormy, I love to see such a cattle drive one day! Thank you! Hi Scardimo, wonderful to have such history in your homerown! And a zoo is always a lovely place! Thank you! I live in San Diego, California, USA. We are known as the birthplace of California, because San Diego was the first West Coast site visited by Europeans (in 1542)! Hi Natalie, wow, that is so cool! My husband visited San Diego, I would love to go too some day! Thank you! Hello, I am from Dallas, TX, known for the Dallas Cowboys and the JFK assassination (unfortunately.) Did you know that every year on JFK death anniversary, photographers gather at the Grassy Knoll and take photos? Hi Pau, remembering and honoring a great legend is very beautiful. Thank you! Hi Sverlana, I love special architecture! That sounds beautiful! Thank you! Hi! I live in Rimini since last May, a small but delightful Italian city. Elegant while touristic, it has fashion, culture and the Sea. I like it so much because I finally found the right combination between me and a city..
Hi Chiara, that is awesome, to find a place that really fits you! Thank you! Near me is Troy, NY. It’s where “Uncle Sam” is from and yes, he was a real person! The term Uncle Sam is derived from Samuel Wilson, a meat packer who supplied rations for the soldiers during the War of 1812. Hi Candace, I really did not know Uncle Sam was a real person! Thank you! Hi Kathy, yes that is true, but a Disney park nearby would be nice! Thank you! Hi Sherry, you can tell Ohm if there are jewellers that can sell Ohm. A big mall is very nice when the weather is bad! Thank you! Orenburg region is a small region bordering Kazakhstan. It is famous all over the world feather scarves that make our needlewoman since ancient times. Also, in my area I was born and lived, Yuri Gagarin, who made the first flight into space. Hi Елена, I love delecate needle work! And the first man in space is very special! Thank you! I am from Mississippi in the United States. It in in the south and considered quite backwoods. I’ve been asked on trips if we were shoes and read. It’s quite insulting. We’re quite well educated and house some of the best doctors in the country thank you! Hi Kristen, we have that same thing here, I live in the very north eastern part of the Netherlands. Some people think we still live in huts. Thank you! I am from A littel town i Denmark, called Tarm. We used to have 26 butiks but know vi only have 5. This town is Merkur dead bur we are still going Strong, we will not give in. I do not know if is ok, but thats is what it is. By tha Way we have A Royal familie. Hi Yrsa, we go on holiday to Thy in Denmark every summer and we love it! Thank you! Jeg undrer hvor min kommentarer blevet af. Hello! I live in Russia in the science town of Dubna. Russia’s largest center for research in nuclear physics. In connection with the organization of the Joint Institute for Nuclear Research (JINR). Built in Dubna Synchrocyclotron and synchrotron in the 60s were the world’s largest accelerator of charged particles, and played a significant role in the development of physics! Hi Vedmau, your town contributed highly to modern science, awesome! I live in Lloret de Mar in Spain, is a touristic little city on the coast with a little castle next to the sea. But the young people don’t know that is not a real castle, is a house that some rich people constructted 50 years ago or so. Funny thing is that its in all the postcards as a “monument” but when you see old pictures the castle is not there xD. Hi Beatriz, your town is well known here for the nice beaches and gorgeous weather. Your castle sounds lovely! Thank you! Hi María, that is so very exciting, love it! Thank you! Hi, I’m from the State of Maryland, USA, home of the Star Spangled Banner and the Naval Academy. Also we are located right next to Washington D.C.
Hi Melinda, that is a very beautiful piece of America! Thank you! Here in Spain is typical to eat Paella, tortilla (omelete made with potatoes), drink Sangría :D.
Hi Ana, yes, that are yummy food and drinks! I enjoyed great food when I was in Spain! Thank you! Hi Ana, you are the winner of the Bucket List bead! Please send you address so we can sent you your price! I’m spanish and where I live is a touristic city, so I can’t talk soo much about traditions from here :S . People from south Spain use to do “tapas time” during the afternoons, they sit in a bar, and with each drink the bar gives a small “something for eat” (sometimes chips, olives, small bread with cheese, etc..). So after few drinks they had already eaten. Hi Susana, I love the Spanish tapas, the food is so delicious! Thank you! Hi Cristina, that sounds delicious! I would love to try some! Thank you! I live in Michigan. My town almost was home to Cedar Point that ended up being put in Ohio, but we got a prison instead lol. Hi Daria, ouch, that was not the most fun thing to get! Thank you! Hi Rachel, that’s not very nice! The taxes here in the Netherlands are awful too! Thank you! I’m from beautiful Denver, Colorado. Lots of snow thus week and 8 degrees today. Hi Ginger, I would love some snow, I do not like lots of rain in winter! Thank you! Greetings, I’m from Maryland in the United States. We are famous for are Maryland Blue Crab. Delicious!!! Minutes from Washington DC for great sight seeing. Awesome place to live. Hi Courtney, that is a beautiful area with a lot of historic places! Thank you! Hi Dian, I would love to visit Australia one day! You are the first form down under! Thank you! I live in Huntington Beach California, where we have a beautiful pier that juts out into the Pacific Ocean, and the US Open of Surfing (an international surfing competition) takes place there every summer. I am too late, I think, but thank you anyway! Hi Leeanne, I am still awake, so you are in! California is on my Bucket List! Hi Dawn, that is a beautiful area where you live! Thank you! I’m from Florida the sunshine state. Hi Millie, I love it that you are here! Thank you! Hi. I’m here in Sevierville, TN. Hometown of Dolly Parton. We are also at the edge of the Great Smoky Mountains National Park. We have a large population of black bears. I live in New York. People come from all over the world to see New York. It has many tourist attractions like Times Square. At Times Square a ball drops to celebrate new years. Millions of people go there to see the ball drop. Greetings from Singapore. There is no duty free for cigarettes brought into Singapore. So, you got to declare them. If you don’t and they happen to spot check your bag (and find the cigarettes there), you will get fined (heavily). I’m from a free, democratic,morden society Taiwan whose people are fun-loving and friendly.Taiwan has a great mixture of urban metropolis and nature! You may not know it, but some brands you’ve been using are from Taiwan, including Giant and HTC! I live in Lancaster Pennsylvania and we are known for being Amish. We do have a HUGE Amish population, however we are also a wonderful tourist area! I get stuck behind lots of Amish buggies on my way to/from work! Did you know Fall/winter is the time of year they get married, on Thursdays! That’s a fun fact! Hi! I’m from Rockford,IL. I grew up in Chicago IL and I’m not too familiar with facts about Rockford. (Something that I have got to change since we live here) The thing you must do when in Chicago is make weekend of seeing all of the beautiful museums downtown. And don’t forget to schedule an river boat tour and look and learn about the city’s beautiful and unique architecture. I live in Dresden, Germany.